Free Shipping Included! Light Up LED Disc Golf Kit - LED Discs & Lights for Basket - (Actual Basket Not Included) by GlowCity at Scruffs Game. MPN: LED_discgolfkit. Hurry! Limited time offer. Offer valid only while supplies last. Disc Golf has never been this cool. Now you can play the game after dark with this amazing Light Up Disc and Cage Set (baskets Not included). Disc Golf has never been this cool. Now you can play the game after dark with this amazing Light Up Disc and Cage Set (baskets Not included). Included In your order will be 3 Official Size and Weight LED Discs made specifically for Disc Golf by Nite Ize: 1 Light Up LED Driver Disc, 1 Light Up LED Mid-Range Disc and 1 Light Up LED Putter Disc. The Disc's are completely water resistant, so a little rain or snow will not hurt them. They are extremely durable made with a special material for that perfect grip. Disc's can run a solid 20 hours before having to replace the batteries. You can choose up to 6 different colors by the push of a button. Also included in your order are the 2 LED Puck Lights to illuminate your cages, you will be amazed how bright your cage will look after installing the lights face down on the top of your cage. Don't Let The sunset be the end to a great game of Disc Golf Continue the game through the Night with this remarkable product. 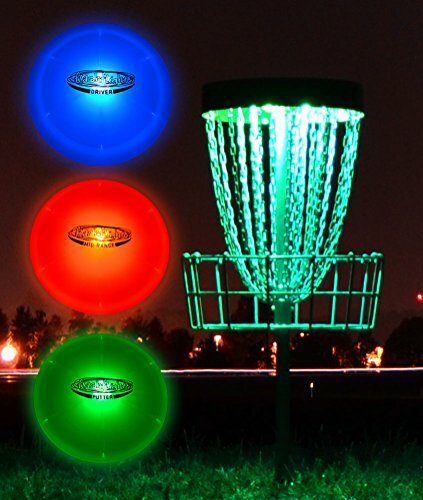 GlowCitys Custom Disc Golf Set Includes 3 LED Light Up Color Changeable Discs-Driver, Mid-Range, And Putter and 2 of Our LED Pucks to Illuminate Your Baskets. Each Disc Has the Option to Select from Six Different Disc Colors with Push Of A Button. You'll be Astounded at the Intensity of the Lights These Discs Glow With! Comes with Two Color Changing Remote Control LED Pucks To Keep Your Cage Lit for Hours. These are also Specially Designed to be Fully Water Resistant so a Few Rain Drops or Snowflakes Won't Hurt Them. Take Disc Golf to The Next Level with This Brilliant New Product. Even if You Are Just Starting Off This is a Wonderful Innovation to Help You Start. FIRST CLASS CUSTOMER SERVICE: GlowCity strives to provide the best customer service to our customers. We provide a 60-day hassle free repair/replace guarantee on all our products.